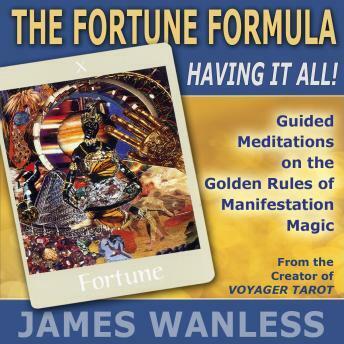 James Wanless, renowned creator of the best-selling Voyager Tarot, has created two powerful guided meditation journeys to help you activate the highest, deepest and fullest expression of yourself. Inspired by the Fortune card in the Voyager deck, these meditations will inspire you to live your life purpose so that you can be happy, healthy and wealthy AND make the world a better place! This guided meditation takes you on a journey through the 10 Golden Rules of Fortune creation. You will discover how to activate your whole self, utilizing the power of your mind, heart, body and spirit. Like an alchemist, you have the power and magic to turn your desires into rich results and realized dreams. You can have it all! The Fortune Instinct: Having it All Naturally! This guided journey helps you activate a life that is whole and sustainable - happy, healthy and wealthy! The Fortune life is an innate part of your nature. You already have it all in this very moment. Through this meditation, you will learn how to allow your natural instincts to guide you so that you can live as the vibrant spirit you are meant to be. The rich and prosperous life you desire, filled with joy and love is closer than you think. Bring out your unique talents and potentials to fulfill your personal destiny! These guided meditations are designed for repeated listening, supporting your journey to activate YOUR FORTUNE INSTINCT!